One of the most recent developments in the electric locomotive concept is Octeon, developed by Adtranz, one of the world’s leading manufacturers in this area. This is a modular product concept that offers customers low maintenance and high flexibility using state-of-the-art technologies and proven designs. 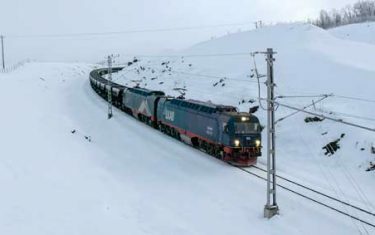 It has allowed the design, for example, of powerful electric locomotives that haul international trains across borders on tracks with different electrical supply and safety systems. SKF has worked closely with Adtranz on a crucial part of this development programme – the integrated drive system. Using its knowledge of bearings in transmission systems, SKF has helped optimise its part in this railway application and help rail operators meet ever-higher demands in a competitive market with attractive, yet productive and efficient, locomotive designs. Today the Adtranz integrated drive concept has been successfully applied to a number of locomotives and multiple electrical units. Some 1,600 integrated drive systems, in a variety of types and sizes, are operating in Austria, Brazil, Germany, Greece, Italy, Poland and Switzerland. The international railway group Adtranz is one of the major players in the world railway rolling stock market and also a complete provider of railway systems. In January this year, DaimlerChrysler became the sole owner of Adtranz, after acquiring the 50 % of the shares then held by ABB. The Adtranz group’s product portfolio ranges from electric and diesel locomotives and ICE and X 2000 high-speed trains to intercity and regional trains, light rail vehicles and underground trains, People Movers, signal and traffic-control systems, fixed installations and infrastructure as well as servicing and maintenance.The group has 25,000 employees. Modular design makes the new Adtranz Octeon locomotives flexible. SKF optimised the bearings for the integrated drive system.Electric locomotives are the traction workhorses that form the backbone of railway transport. The customer’s choice of locomotive depends on particular transportation and infrastructure requirements. Ultimately, the choice is the result of a process in which alternative solutions are compared and engineering expertise is combined with the specific needs of the customer. One of the most recent developments from Adtranz is the electric locomotive concept called Octeon, which was presented in 1998 at the Adtranz Railway Conference in Oslo. This is a modular product platform covering all applications based on standard components, assemblies and interfaces. It offers customers low maintenance and high flexibility using state-of-the-art technologies and proven designs. For example, powerful electric locomotives are now available that haul international trains across borders on tracks with different electrical supply and safety systems. This development is essential for trans-European railway transport. Infrastructure and transportation requirements differ considerably from one railway company to another. This has a direct impact on locomotive design. The most important factors to be taken into consideration are catenary voltage, track gauge, signalling and safety systems, driver’s cab installations, train couplings, track forces, catenary distortion etc. To these must be added specific service requirements (passenger freight or high-speed passenger trains), as well as technical responses to topology operating conditions such as terrain, climate, dust etc. Adtranz’ approach to these challenges was to construct the desired locomotive from a basic unified locomotive concept by means of a portfolio of standard, proven components and assemblies. Special emphasis was placed on maintenance and life-cycle costs. Substantial improvements result from following this strict modular approach. Pre-tested assemblies have only a few, standardised interfaces with the rest of the locomotive, so assembly and commissioning times are greatly reduced. This, in turn, greatly simplifies repair and later upgrading or replacement of the assemblies. The result: reduced costs that provide the railways with exceptional flexibility to tailor each locomotive for changing applications over its lifetime. 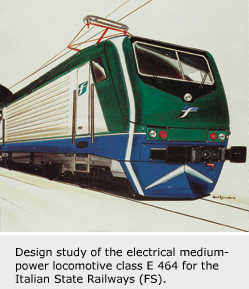 One example of the Octeon product range is the E 464 electric locomotive for the Italian State Railways, Ferrovie dello Stato (FS). The company ordered 50 locomotives, with an option for an additional 50, following an international invitation to tender. A crucial factor in helping Adtranz to win the bid was the modular design of the locomotives, which lowers production and maintenance costs. In addition, the lower tare weights of the vehicles reduce energy consumption and wear on the rails. The gearbox can be produced unsplit and is therefore very rigid. All parts screwed on to the gearbox are sealed by means of O-rings. The pinion bearing is accommodated in the gearbox and the sealing between gearbox and traction motor can be arranged optimally. The radial bearing force can be reduced as a result of this arrangement by 12 % to 25 %. The hollow cardan shaft is able to accommodate one or two disc brakes. An innovative labyrinth system fitted with a vent pipe prevents oil leakage from the gear unit, which contributes considerably to environmental protection. The drive system for the E 464 loco is fully suspended. This results in a reduction of the dynamic forces between wheel and rail, which contributes to a higher service life of wheels, rails and all drive components. 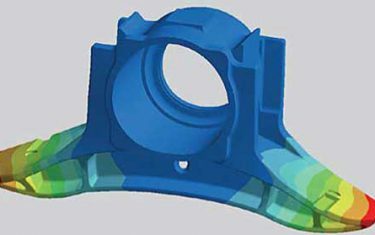 The material for the gear case and cardan hollow shaft is nodular cast iron, type GGG40. The drive is based on a low-maintenance concept, which aims, for example, at oil change intervals of about 1 million km and bearing change intervals of 2 million km. The use of the integrated drive concept allows savings in parts, mass and space. Oil lubrication is achieved by a minimum oil flow. This contributes to a low operating gear case temperature, which results in low friction of all rotating components and high efficiency. Based on consideration of all drive system components such as oil splash, air ventilation, bearing friction, tooth contacts, the efficiency coefficient is more than 98 % for this two-step gearing. Design and production of the integrated gearbox is by Adtranz at Wiener Neudorf in Austria. The three-phase traction motor is directly screwed on to the gearbox casing without any end shield. On the non-drive side, a deep groove ball bearing, equipped with a brass cage, supports radial and axial loads and locates the traction motor shaft in the axial direction. This is the only grease lubricated bearing in the drive system. The maximum traction motor speed is 4,200 r/min. On the traction motor shaft, a pinion is directly fitted with a strong press fit, while the cylindrical roller bearing is mounted directly inside the gearbox. This NU type bearing is oil lubricated and supports only radial loads. The shaft deflection could be minimised by a special design and is less than 3 minutes of arc at this bearing location in operation. To allow the use of a hollow cardan shaft with mounted disc brakes, the distance between the traction motor and the wheel set axle requires a two-step gearbox. Cylindrical roller bearings are situated on both sides, equipped with a strong one-piece brass cage guided on the shoulder of the outer ring. The NUP type bearing supports radial and axial loads, while the NJ bearing supports only radial loads because of a designed small gap between the inner and outer ring. These bearings are also oil lubricated. The thin section cylindrical roller bearings type NU and NUP of the hollow shaft are also equipped with a strong one-piece brass cage guided on the outer ring shoulder. Both bearing outer rings are fitted into a mounting sleeve to allow an easier mounting procedure. The two-stage labyrinth sealing with a vent pipe is designed to minimise oil leakage. To achieve a fully suspended drive unit, a hollow cardan shaft is fitted with two specially designed elastic couplings, one to the wheel and one to the hollow shaft of the drive system. These elastic linkage couplings are fitted with spherical rubber elements. Railway gearboxes operate at high temperatures. Special oils are also applied that can be aggressive to polymer cages, so brass material offers a higher reliability solution. 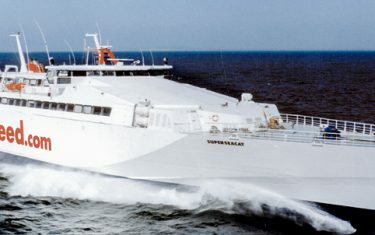 Additional dynamic forces are acting during operation. To achieve optimum reliability, one-piece cage designs are chosen to avoid riveting of two-piece cage designs. These cages are shoulder guided, to achieve a better performance. One solution for producing this one-piece brass cage is to broach the pockets. Concave contact surface between cage bar and roller improves lubrication film formation. Weight is reduced by optimisation of geometry. Especially with higher vibration levels and radial acceleration, as in transmission systems for railway vehicles, the bearing behaviour and reliability can be improved. Oil flow within the bearing is increased and wear and friction reduced even under lubricant starvation conditions. Optimised retention for the rollers, which allows easier mounting or separation of these cylindrical roller bearings. The SKF cylindrical roller bearings with their unique ML cages are used in this specific application at the drive shaft and intermediate shaft cylindrical roller bearing locations. 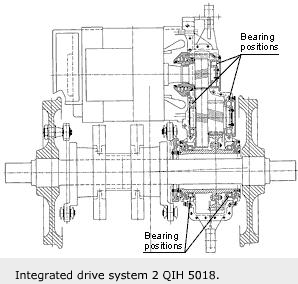 The first gearbox was type tested for 200 hours in both directions to optimise the operating bearing temperature by using various oil flow concepts. A further result of this temperature optimisation was to specify a certain increased radial clearance of the cylindrical roller bearings. The Adtranz integrated drive concept is today applied in various locomotives and in electrical multiple units with good results. Integrated drives delivered in different types and sizes already total around 1,600 and are operating in Austria, Brazil, Germany, Greece, Italy, Poland and Switzerland.